I want to cast magic missile! Truthfully, don’t we ALL want to cast magic missile. Who cares if there’s nothing to attack? You can cast magic missile at the darkness. It’s the kind of thing that we’ve been dreaming about, ever since the days of playing tabletop games in the basement as a teenager. Alas, we live in a technology driven society, where magic happens only in video games and during your last tabletop RPG campaign. That ends today. From now on, you’re going to start dressing like the job you want… Dark Wizard. We have just the outfit for your transformation. This Dark Wizard costume comes with everything you need to begin your studies into the magical arts. It comes with an adult robe that will have you looking like an acolyte of mystic teachings. Of course, it’ll be up to you to figure exactly how magic works, but all the great wizards had to learn the most basic of magic from scratch (including magic missile). 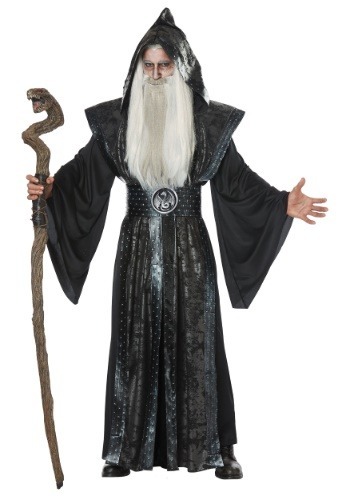 Just make sure you grow a healthy beard before you wear this costume, since no one takes any wizard seriously unless they have a rockin’ beard. Once you have the costume, it’ll be up to determine your path! Do you become the chaotic evil wizard, bent on discovering the latest in evil magic? Or do you become Galstaff, the Sorcerer of Light, who is committed to casting magic missile at the darkness, wherever it might be lurking? The choice is yours, so choose wisely!